Peter Rabbit and Flopsy Bunny star in an exciting nursery and preschool toy range which features a fresh new look for 2014. Bringing a contemporary twist to these classic and much-loved characters, the new Peter Rabbit range will be loved by babies, toddlers and parents alike. My First Peter is a charming plush toy that features an embroidered radish on his blue jacket and the iconic image of Peter Rabbit on his foot. My First Flopsy is a cute soft toy with an embroidered butterfly on her pink jacket and an image of Flopsy Bunny on her foot. Elsewhere in Rainbow's Peter Rabbit range are the beautifully illustrated Stacking Blocks and a pull-along Peter that features an adorable Peter Rabbit secured to wooden wheels with a pull along cord making it easy for little ones to pull Peter Rabbit along. Fans of Beatrix Potter's charming classic characters will also adore the Musical Peter Rabbit, the Peter Rabbit Comfort Blanket, Peter Rabbit and Flopsy Bunny Bean Rattles, the wooden Peg Puzzle and the Wooden Dominoes. 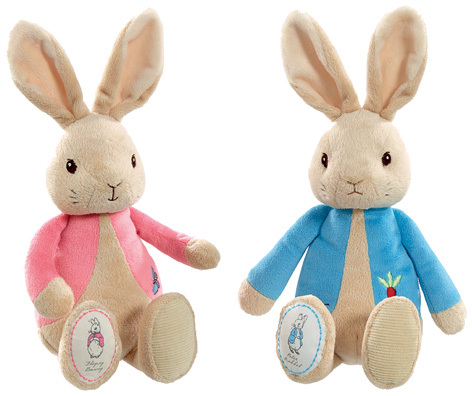 Please tell us what you think of the Peter Rabbit and Flopsy Bunny by Peter Rabbit and Rainbow Designs.